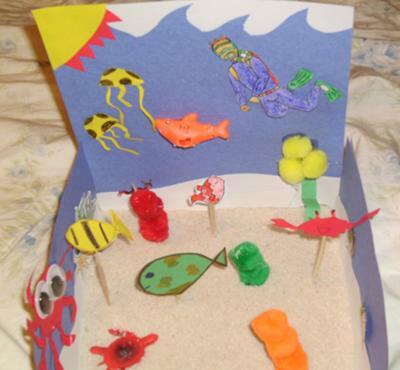 My play therapy mystery counseling technique session was to be titled “Under the Sea.” I was to use what limited supplies I had a home to create a world that would fit under the ocean. First I started with the water. The waves are large and sharp. I think of this as being fun and choppy. Next I added the sun because it reminds me of how our earth is heated. It also gives me a sense of happiness. Most importantly is the sand on the sea floor. 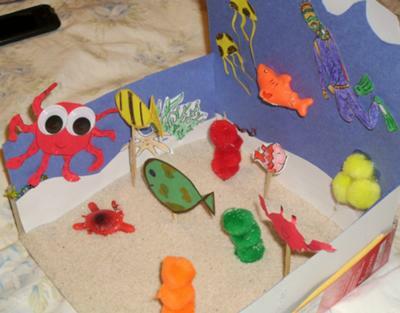 I love how the sand fills in my fingers as I add creatures and wildlife. I wanted to have a variety of animals so that the client will have a chance to choose from a larger variety of miniatures. There a few fish, each varying in size and color. Also there is an octopus that lurks beneath the water. There is a shark that is not only a predator for many animals, but he too has been injured from the deep waters. The crap is fun to have in the scene. He can represent so many different aspects of a person’s life. There are two jellyfish. They are similar in shape and color. They also sting you. This could be a problem that someone has. 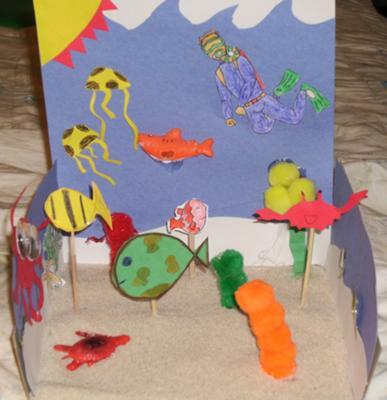 The puff balls represent different corals and sea weed that float grow in the ocean. Finally the diver was added. I think he gives the play therapy scene a realistic view. I love looking at all of the fish and corals within the sea. This diver to me represents, me looking in at this play therapy majestic world.